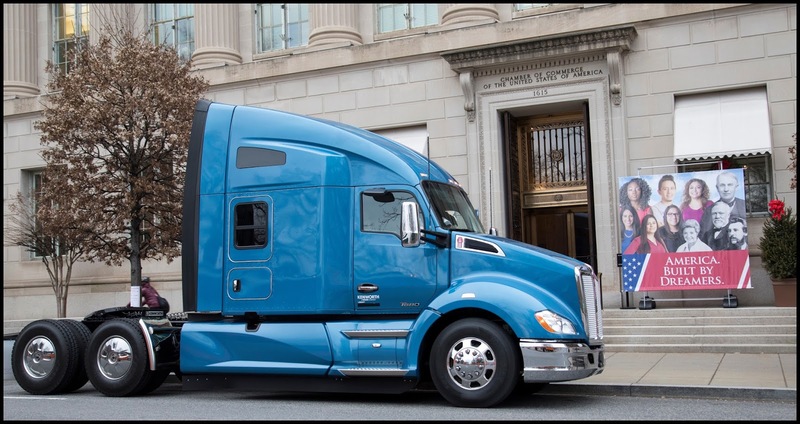 WASHINGTON, D.C., Dec. 18, 2017 – A highly decorated retired U.S. Army lieutenant colonel was awarded the “Transition Trucking: Driving for Excellence” honor at a ceremony held at the U.S. Chamber of Commerce Foundation in Washington, D.C.
Kenworth presented Stevens Transport driver Gregg Softy with a Kenworth T680 Advantage equipped with a fuel-efficient 455-hp PACCAR MX-13 engine, and a comfortable 76-inch sleeper with the Kenworth Driver Studio package of premium features that combine to create a luxurious, relaxing and comfortable living environment. 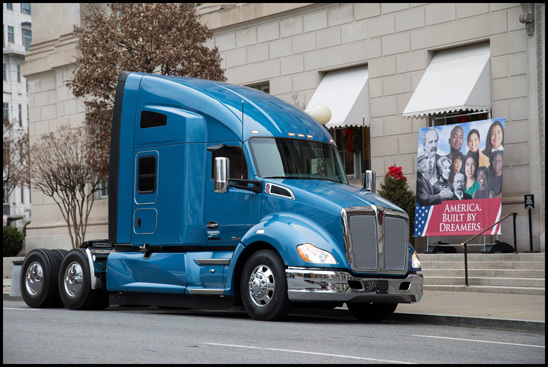 The West Point graduate received the Kenworth T680 as part of the U.S. Chamber of Commerce Foundation’s Hiring Our Heroes Program, which was conducted in partnership with the FASTPORT Trucking Track Mentoring Program. Wayne Roy, a driver with U.S. Express and U.S. Marine Corps veteran, and Daniel Shonebarger, a driver with Melton Truck Lines and U.S. Navy veteran, were runners-up and presented with $10,000 checks. Kurt Swihart, Kenworth marketing director, represented Kenworth in presenting the T680 keys to Softy, a former U.S. Army lieutenant colonel, at a ceremony held by the Foundation in the Hall of Flags at the U.S. Chamber of Commerce building in Washington, D.C. Shannon DiBari, U.S. Chamber of Commerce chief operating officer; Eric Eversole, Hiring Our Heroes president; Brad Brentley, FASTPORT president; and U.S. Army Col. Samuel Whitehurst, director of Soldier for Life; addressed the event and were on hand to help Swihart present the award and Kenworth T680 Advantage. Bob Bowden, MHC Kenworth Texas vice president of regional sales, also attended the event. For the past 26 years, Bowden has worked closely with Stevens Transport supporting its business needs. The dealership donated its services to help deliver the Kenworth T680 Advantage to the winner, and Bowden presented Softy with a $2,500 certificate for accessories for his new Kenworth. FASTPORT president Brad Bentley said the three veterans-turned truck drivers were determined by tallying scores from a Selection Committee. The three finalists then advanced to an online vote on the Transition Trucking website, where people could view a video of each driver and vote their choice for the top military veteran rookie driver. Softy served in the U.S. Army in active duty for 28 years after graduating from the U.S. Military Academy at West Point. During his career in the U.S. Army, he served in six overseas deployments – Operation Desert Shield/Desert Storm, Operation Unified Response (Haiti), Operation Iraqi Freedom, Kosovo, Operation Enduring Freedom in Afghanistan and Operation Unified Protector – a NATO operation in Libya. He received three Bronze Stars, a Legion of Merit, a Defense Meritorious service medal, and a number of other service and combat badges, decorations and medals. His training included command and general staff college, armor officer basic and advanced courses, counter-insurgency training, NATO staff school, and U.S. Army Airborne School training. After retirement from his distinguished military career, Softy said becoming a truck driver was a logical choice because it fulfilled a lifelong dream and offered new opportunities.